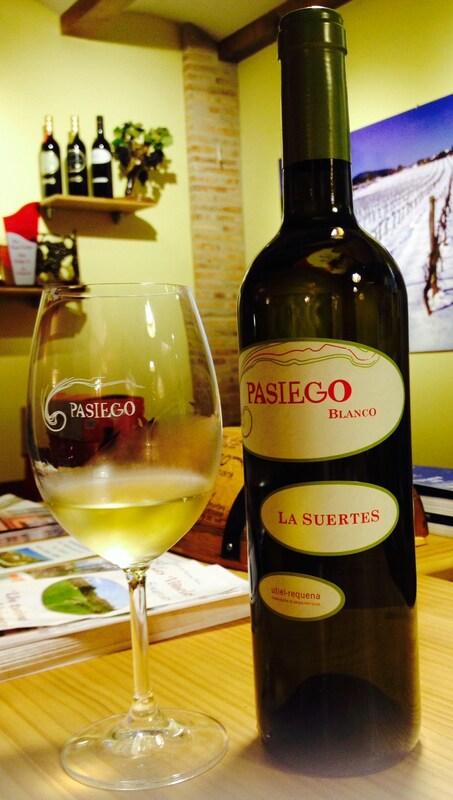 A Visit to Bodegas Pasiego. Learning About Bobal. Our visit this week was to the bijou bodega in Sinarcas, Pasiego. Here under the direction of José Luis Perez the bodega has quietly been expanding its range of wines since I had last visited at the end of November 2011. The bodega is right on the edge of Utiel-Requena, go past the vineyards on the road to Teruel and half way across the meseta surrounded by hills and mountains and you cross into Cuenca province. These are just about the highest vineyards within the D.O. at 900m above sea level. They are regularly subject to snowfall in winter and the grapes that grow here are different ( even though they may be of the same variety) than those grown at lower levels of vineyard land in Utiel-Requena. 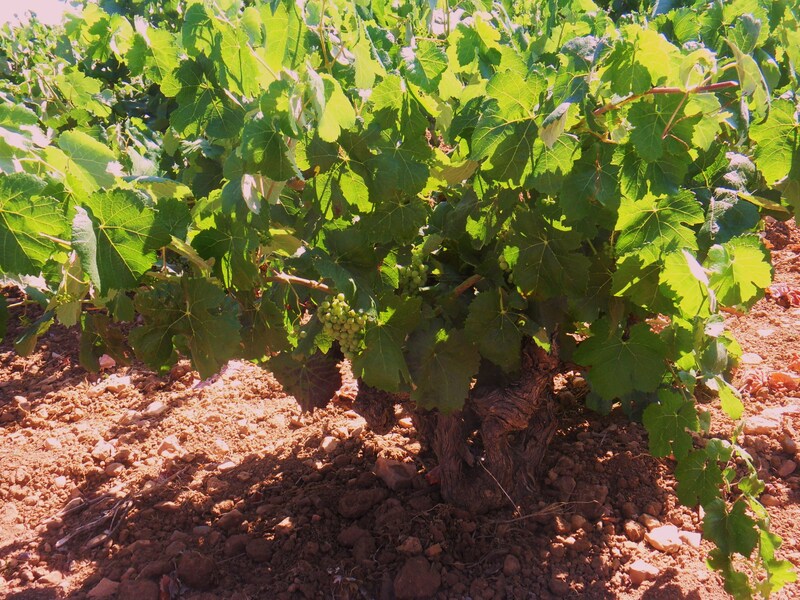 For example Bobal grapes, the regional variety, have noticeably thicker skins than those grown elsewhere and both flower and ripen later in the Autumn. José Luis is one of a small number of wine-maker/ growers in the region who is keen to understand more about the nature of this variety. The bodega is one of seven who formed the Asociación Primum Bobal some three years ago in a project which was aimed specifically at promoting wine from the variety but also to investigate the variety, understand its clones and identify types and soils which are best matched so that future plantings produce better vines and wines for future generations. 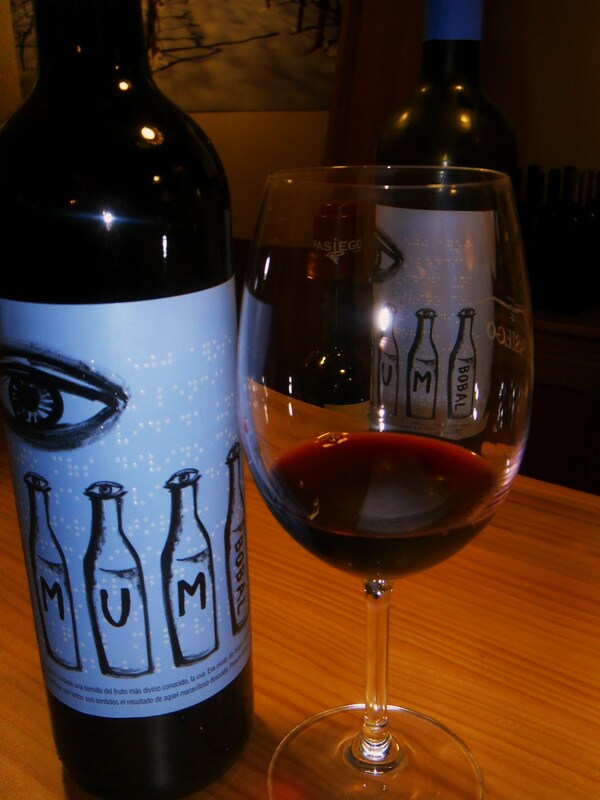 They introduced a wine, Primum Bobal in a limited edition each year of about 13k bottles which has sold out quickly. We will look at the 2013 vintage, just released, later in the post. 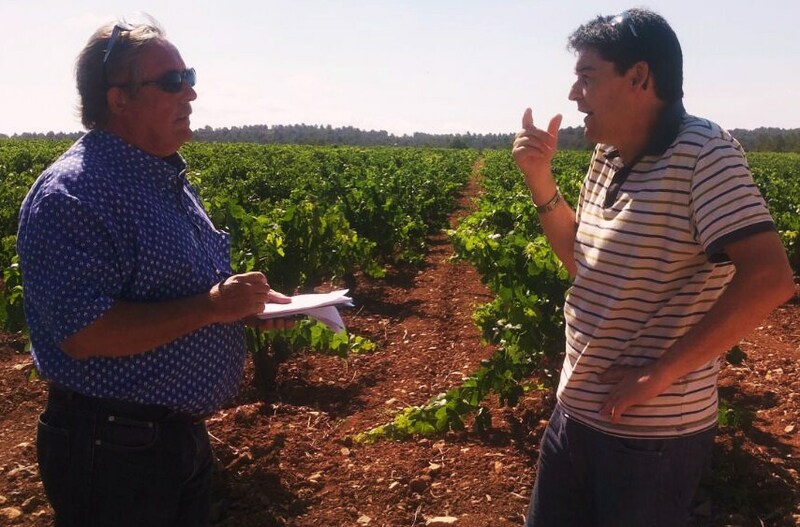 I had specifically asked José Luis if we could visit the vineyards and look at his planting and pruning methods. I knew the bodega was committed to experimenting to see how different methods worked, or otherwise. 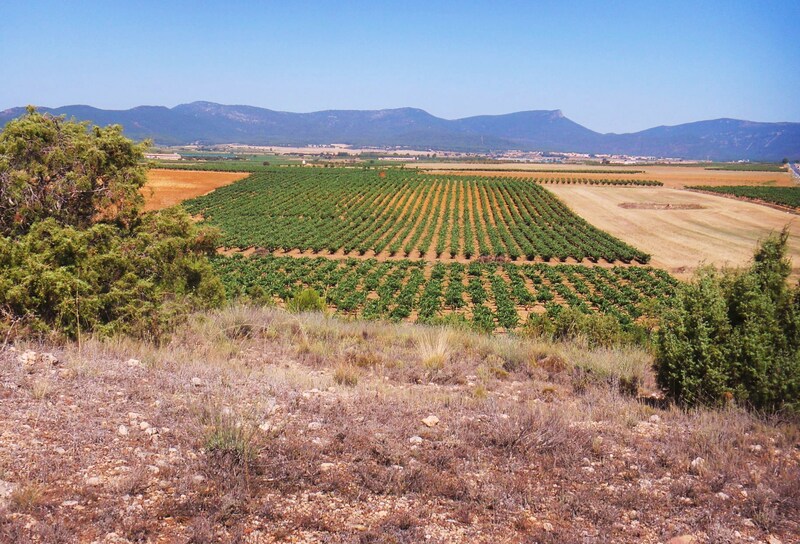 Immediately that you find his first plot of Bobal,( the bodega has several parcels of this variety and others), spread out around the town, you can see two styles. 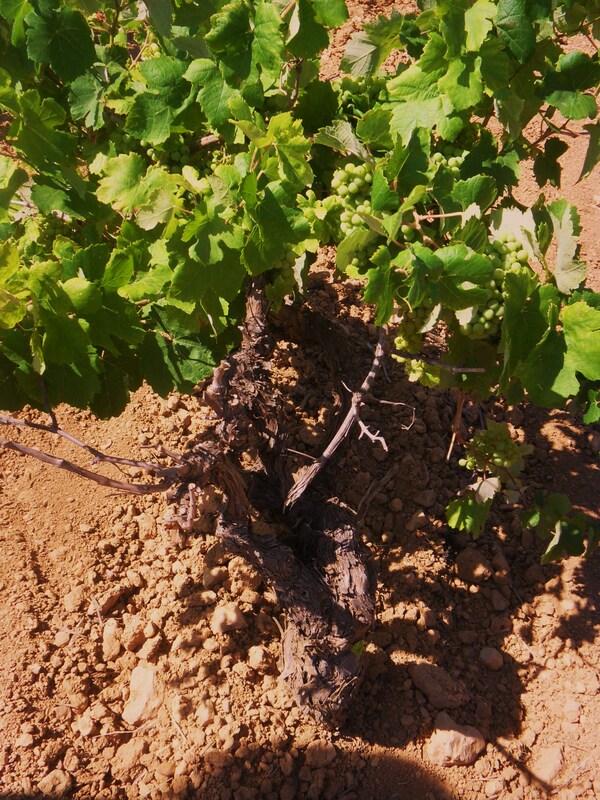 Here the Bobal has been planted traditionally `en vaso´, short trunk and with five `arms´on which the grapes grow. This is the goblet style of the Rhone valley and Bordeaux. Apart from a little evidence of hail damage the vines here looked healthy. Four rows away the variety had been pruned differently. Here the trunk remained short but the arms appeared to be `en espaldera´with two arms, one going in directly the opposite direction to the other neatly up the rows. This makes mechanical harvesting possible. Stony soil in the Vineyards. José Luis also explained different pruning methods. One he currently favours is to wait for the fruit to set and the vine to produce sufficient growth to provide shade to the vine. the tendrils at the end of the arms are then removed together with the leaves around the bunches. 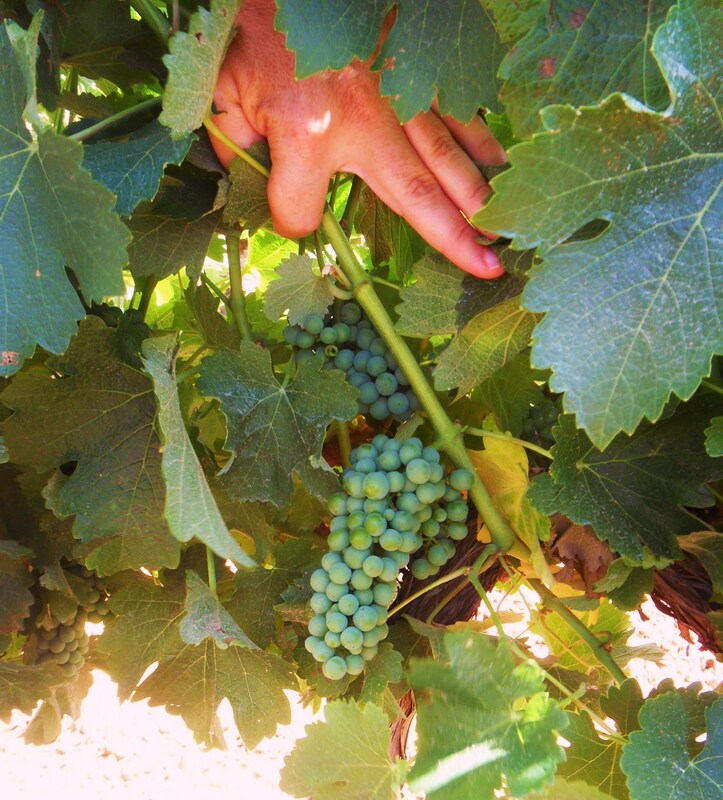 The belief here is that the vine then puts its efforts into the grapes rather than further growth. But not all support this point of view and follow the traditional method of cutting away the excess length but leaving the closest leaves. Whatever, in this particular plot the vines are subject to breezes which largely protect them from the usual mildew and other diseases. The one drawback is the `poniente´, the hot wind, which when it blows can turn healthy grapes into sultanas in no time at all! From the Bobal plot we moved on to look at his white varieties Chardonnay and Sauvignon Blanc, not far away on the same part of the meseta, neatly supported on wires and all planted `en espaldera´. The plots are all `secano´( that is to say without irrigation) but the bodega do have a couple of water deposits and in very dry periods they can move water by tractor and tank and provide water to the plots which need it….but it is a major additional cost in the process. From here we moved to look at a plot of Tempranillo, planted up a gently sloping hillside. Here there are two different and distinct clones of the variety. 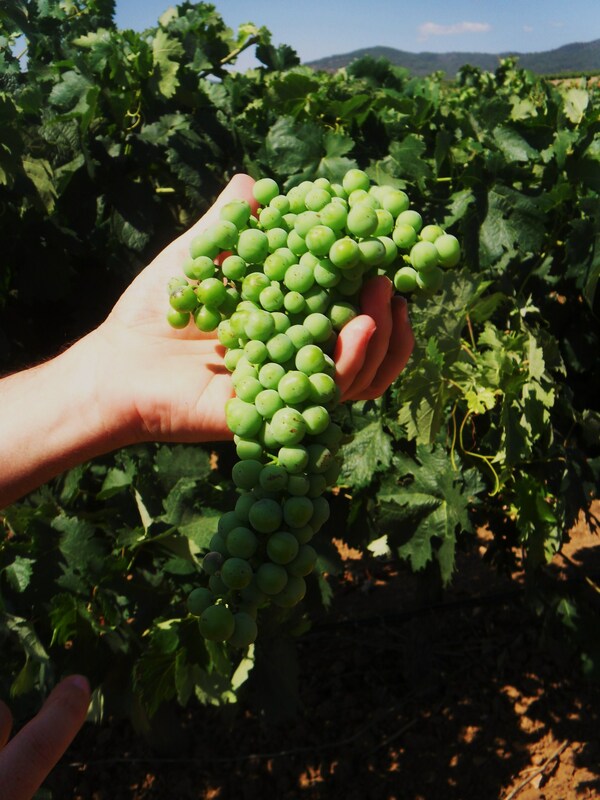 In the lower part the vines produce bunches of grapes which appear to be like Bobal with the long conical shape and lobes at the top which for the `bulls ears´. Those further up the slope are much more traditional with their tightly packed conical bunches. It would be fair to say that José Luis is not the varieties biggest fan, using the tempranillo in blends but never as a mono-varietal.He believes the variety is difficult to deal with here. In general the vineyard suffers from the same problems as others in the area. There is a moth which lays its eggs in the leaves and which if not dealt with quickly can destroy crops within a couple of years. The best, but not the cheapest method to deal with it is by `sexual confusion´ , one of the more biological methods used in all types of agriculture now. There is also a `hongo´ or fungus which attacked a parcel last year, leaving vines with dead arms. Again the most potent treatment is the most expensive where you drill into the trunk and insert the cure directly into the wood. The bodega hand picks and selects manually those grapes it wants to use for their own wines. The remainder will be picked and sold on to the cooperative. Vine Affected by a fungus, with dead wood.. 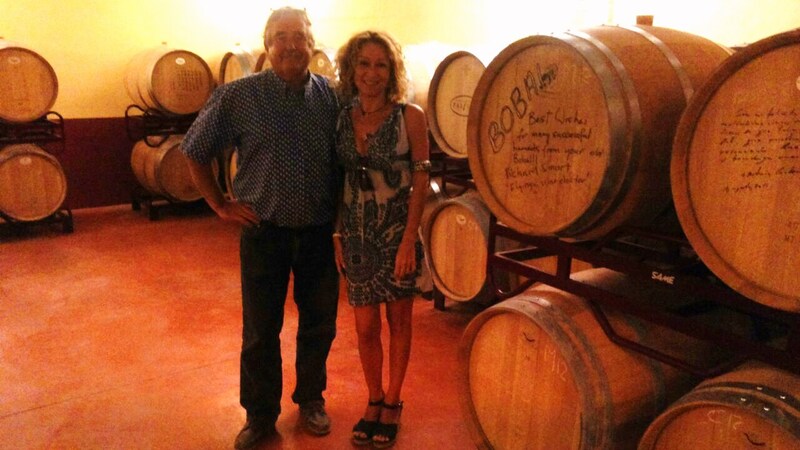 In the bodega there are a handful of small deposits, a small barrel park and a sala de catas and shop. The bodega is artisan and everything is done by hand which means there is small production….wines which are well worth searching out for their quality, proof that the efforts in the vineyard are worth it! 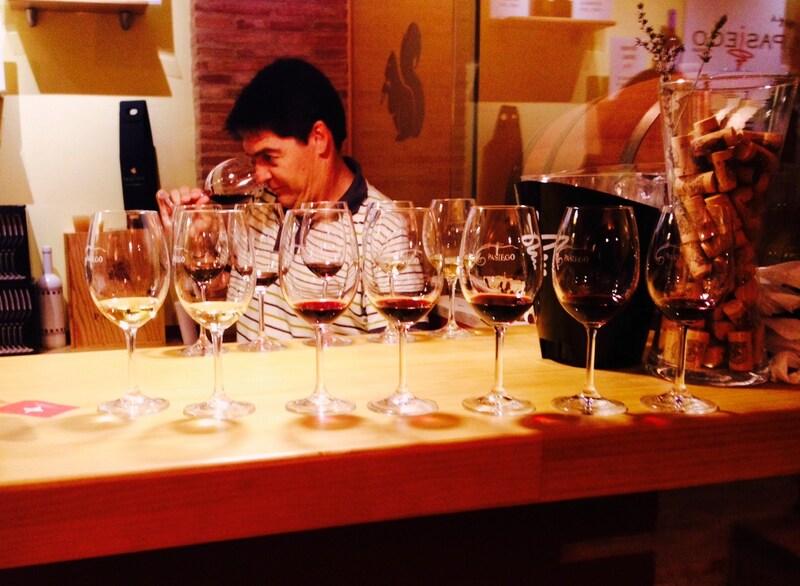 Following a very educational session amongst the vines we were to enjoy a tasting of eight of the bodegas wines…. ( in 2011 they only produced four but then we had enjoyed sampling the new harvest from deposit, some of the wines still undergoing malolactic fermentation). We began with the white, a blend of Chardonnay and Sauvignon Blanc called Suerte and 12.5%ABV. This wine has been consistently good over the years I have tried it and we began with the 2012. Gold, with green flashes, clean and bright. On the nose quite floral, white flowers, tropical fruit, pineapple the wine has spent two months in oak , on the lees with regular battonage. Nonetheless the oak on the nose is muted. In the mouth expressive tropical fruit, excellent balancing acidity, with a long dry mineral finish, reflecting the stony soil in the vineyards. Worth noting that this wine evolves quickly in the glass, within 20 minutes the tropical fruit had been replaced by orange peel on the nose. We moved on and tried the 2013 vintage. This had been in bottle for just a week and we were amongst the first to try it. A similar colour, and the same ABV and blend this was a little muted on the nose. However there was strong hints of banana, a sure sign the acidity in the Chardonnay is perfect, whilst in the mouth this wine was also full with lots of fruit. Within an hour in the glass this too had changed to strong citrus tones of orange marmalade……a wine to keep for a while. This will also have a new , very modern lable from 2014 onwards. The Primum Bobal 2013 was the following wine to try. 100% Bobal, 13.5% ABV this is not exclusively a product of Pasiego. The grapes come from three of the Associations members ( Finca Ardal and Dominio de la Vega are the other two) and represent grapes from two different levels of vineyards. These are vinified separately and in very modern style to produce a light fruity approachable wine which shows the characteristics of the grape variety. As the bottle was uncorked there was an explosion of fruit released! Bright purple youthful wine with a violet edge, and long slow legs. On the nose concentrated red and black fruit, almost jam. In the mouth chocolate, liquorice, spice, smooth tannins, and a very big mouthful of fruit. Persistent slightly sweet long finish This amazing value at 5€ a bottle. The wine is made at Dominio de la Vega by Dani Esposito and Felix Martinez of Vera de Estenas. The La Blasca Crianza, 2008 39% Cabernet Sauvignon, 31% Tempranillo, 17% Merlot and 3% Bobal at 13.7% ABV was the fourth wine. This has had 10 months in American and Hungarian oak. Cherry red, full-bodied with long legs. On the nose, mature red and black fruit, with well-integrated oak and spice. In the mouth it is round, fruity, enjoying a long full finish. 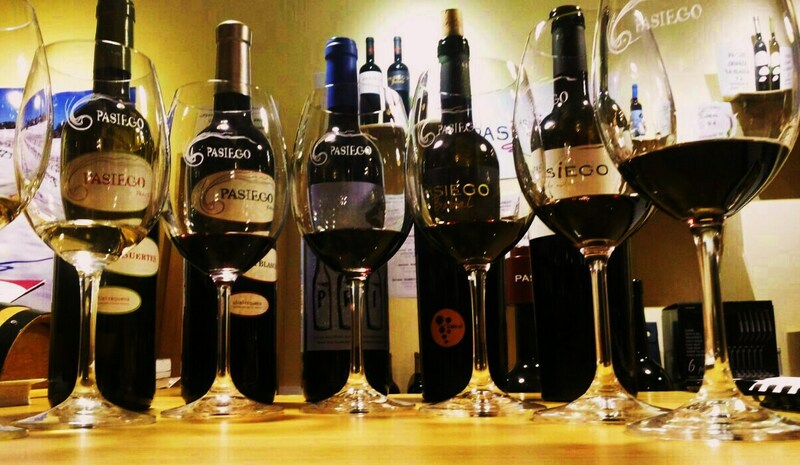 The Pasiego Reserva, 2004, 45% Cabernet Sauvignon, 45% Tempranillo, 10% Merlot 13.2% ABV. This wine has had 14 months in oak of first and second use, a technique which allows for the effects of new wood to be balanced with the lesser effects of using barrels for a second time. Deep red cherry in colour with a terracotta edge and long legs. On the nose, complex, leaf-mold, spice, liquorice. In the mouth this is unctuous, silky, very smooth and round, good volume and a long satisfying finish. The Pasiego, Bobal, 14% ABV is a blend with 15% Merlot, 2010 Vintage. This is the Bodegas homage to the autoctonal variety. It is deep black cherry in colour with long legs and violet streaks. On the nose concentrated fruit, chocolate, smoke complex with plum fruit in the background. In the mouth a big mouthful of cherry fruit, strawberry hints, spice and concentrated flavours which identify the wine as unmistakably Bobal. Lovely wine. Our last wine was the Pasiego Autor 2009, Cabernet Sauvignon, Merlot and Bobal 14%ABV. This wine has had 12 months in oak and is a deep black cherry colour with a violet edge and long legs. On the nose lots of ripe, mature, red and black fruit, rich. In the mouth, mature soft red and black fruit with green pepper, long fruity, meaty and satisfying finish. The bodega is also part of the Rutavino in Utiel-Requena and is in partnership with local holiday accommodation for those who enjoy outdoor pursuits including what look some very attractive packages for bike riders and walkers in particular.On our next visit we will pursue some of these possibilities including trying some of the local gastronomy! This was an educational visit both in the field and the tasting and we were struck by the enthusiasm in particular of José Luis for the quality and style of the bodegas products. There are some real jewels in the crown of this artisan bodega whose wines are well worth searching out. Valencia´s Wine and Food Fair 2012, Observations! Officially the 24th Wine , Cava and Spirits and 22nd Valencian Food Fair , the annual `mostra´ has been plying its trade since Monday evening and carries on until Sunday evening, in the dry riverbed in the city’s centre. A week later than originally announced due to its original coincidence with the Andalusian Fair and a big beer festival `Oktoberfest´ (sic) in the bull-ring causing problems for exhibitors and organisers alike. 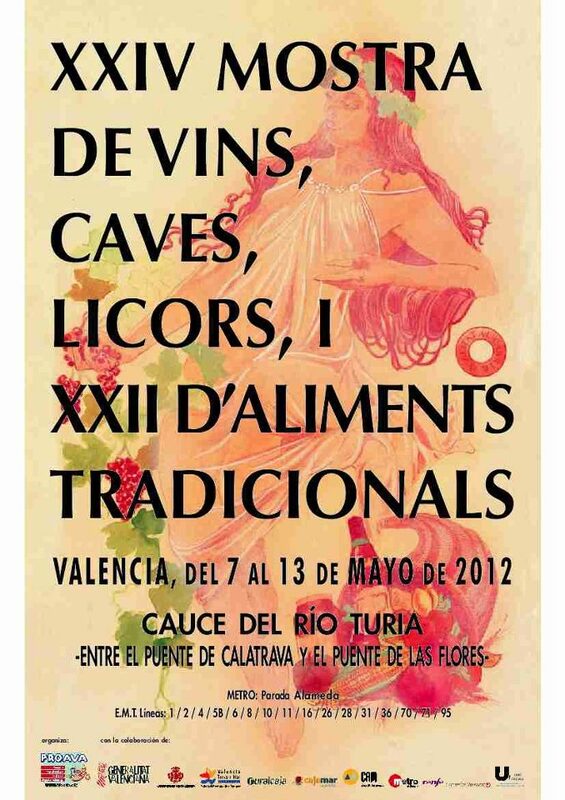 Given the crisis in Spain and the change of dates at the last-minute, not to mention many other fairs where Valencian wine could be displayed and enjoyed it is perhaps not surprising that there are fewer participants this year with some big names missing! Due to very recent surgery my own visits have been limited to a couple of the evening sessions but I still hope to spend Saturday there as well before the fair closes for another year. Valencian wine, in common with much Spanish wine, has found an increasing market abroad in the last twelve months, not just bulk wines but also small quality bodegas. This is true of Valencian wines as well, Chozas Carrascal and Vera de Estenas both now have a toe-hold in London through Alizarin wines, Dominio de la Vega are selling cavas through Layton´s, an independent small wine-merchant serving private customers and restaurants (and which I well remember from the `80 s) , Torroja has been selling wine in UK supermarkets for a while as have relative giants Murviedro and Gandia for some time. Making its debut this year is Primum Bobal. I have reported on the Association Primum Bobal, the Requena based organisation taking its name from the local grape variety ( see archives) which seeks to inprove on the quality of the variety and is researching clones, soil quality etc as well as promoting the wines from the seven bodegas which currently form it. Although I have been lucky to try deposit samples a couple of times before, most notedly in December last year, the wine has now been released in its distinct, blue-labelled bottle with braille. Pere Mercador, spokesperson for the group has been ably dispensing samples to all showing interest! 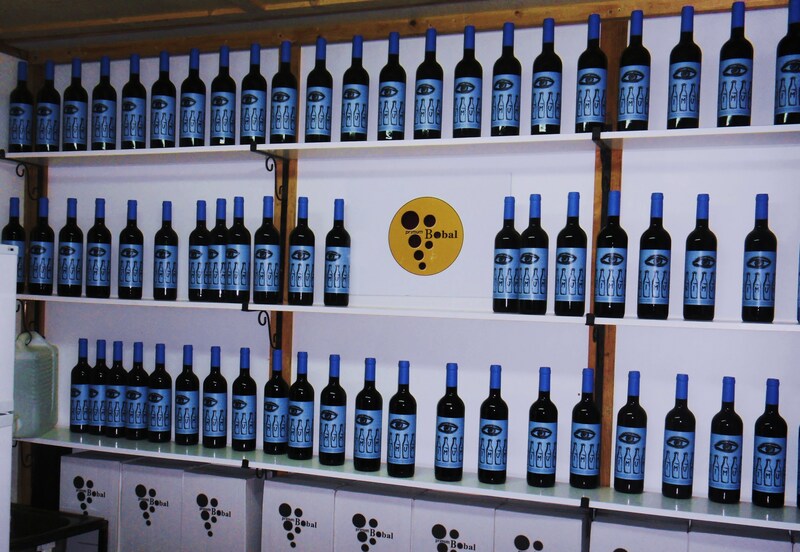 The aim has been to produce a wine which expresses well the typicity of the variety. Chosen from vineyards with a minimum age of 65 years, and with a rigourous selection of grapes for the final selection, the wine has been made by wine makers in the vanguard of enology with the variety. And they have succeeded! Bobal can have an incredible depth of fruit and this young wine displays this by the bucket load! An intense cherry red with long legs and a purple blue edge. On the nose cherry, strawberry and raspberry with a spicy note, whilst in the mouth the fruit is balanced by a fresh acidity, particularly notable being boiled sweets. This is a young fruity fresh `nouveau´and well worth the wait for its release! It is always nice to chat with friends at this fair and I had a brief opportunity to talk with Mariano Taberner of Bodegas Cueva. Some changes are afoot at the bodega and new partners are being sought for the enterprise. For those who wish to part own a bodega and make their own wine this is an innovative opportunity. 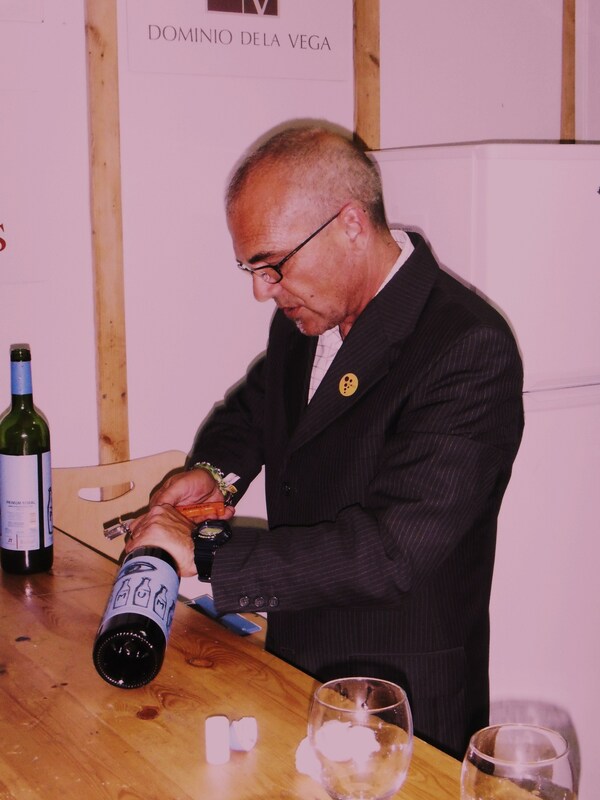 Mariano has always adopted an innovative approach to biodynamic wine-making. He is prepared to share that experience with new partners making the facilities of the bodega available together with training in wine making as well as a space where those partners can hold events and meals and stay at the bodega which dates from the 18th century, in the hamlet of La Portera. More information direct from Mariano ( www.bodegascueava.com). Pere Mercador, Spokesperson for Primum Bobal. It must not be forgotten that the fair follows the annual tasting by Els bodeguers, the independent wine-shops of the region. Many of the wines selected are showcased at the fair and notable winners from Castellon this year were DiVinos with their Odisea and Perdicion wines claiming three prizes in different categories. We enjoyed a glass of the Rosado from Cabernet Sauvignon with its red currant fruit with Carmina from the bodega. On the subject of Rosados we also tried the Parreño from pure Bobal with Louis LaTorre and Manel Guasp from the Venta del Moro bodega which is also a prizewinner….most notably knocking the Coviñas brands of their traditional top spots. Together with the excellent Rosado from Merlot from Finca Collado, summer drinking is going to be exceptional in 2012!!!!!! Thankfully the cheeses from Cati, La Sabina and Gozales Romero from sheep and goats milk are available again this year together with a fine range of local sausages, breads, chocolate and of course the special clochinas ( mussels) from the region. More of these after Saturday´s visit! There is also an increasing number of real ales in bottles being produced in Valencia, with micro-breweries spring up all over. This fair seems to have around eight stalls showing these beers some of which will need further examination. One bodega which warranted further examination in the early part of the fair was Los Pinos the Fontanars based bodega whose wines I have not seen for a couple of years. Immediately it can be said that this is a bodega which I have on my list to visit. Enrique Francisco enthusiastically showed us three wines from this ecologic bodega. 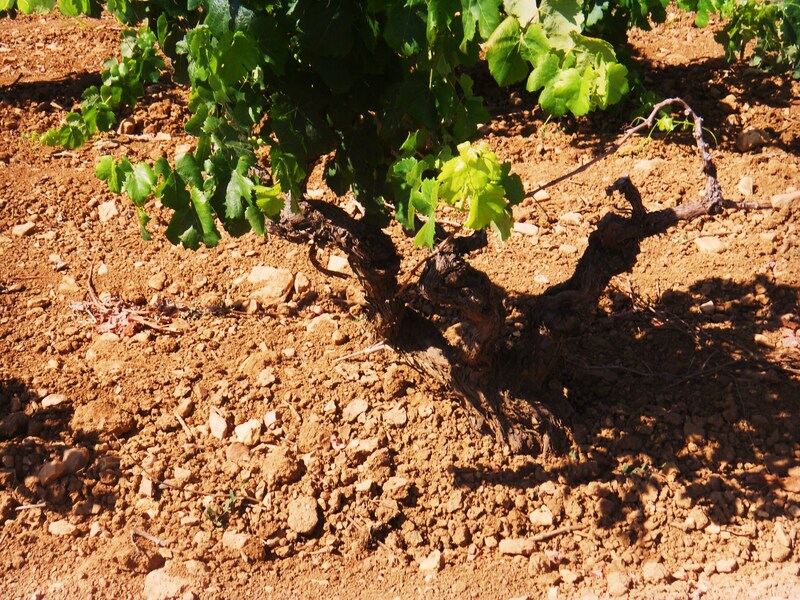 The first was a white `Brote´from Verdil and Viognier, the former from vines with 70 years of age. Pale rose gold, clean and bright with long legs. On the nose tropical fruits, lots of natural sugar and very concentrated. The wine is barrel fermented in french oak before stabilisation in stainless steel to harmonise the fruit with the oak…and very successfully! In the mouth the wood is nicely balanced with rich fruit and fresh acidity……I have noted this is one of the best whites so far tried at the fair…..right up there with Finca Collado 2011, Vera de Estenas Macabeo 2011 and Marsilea Gewurtztraminer 2011. One of the Cheese producers. The Tinto Barrica is a blend of Cabernet Sauvignon, Syrah and Tempranillo, is a multiple prizewinner at overseas fairs. A very young medium to deep cherry red, with very long legs. On the nose wonderful fruit, black cherries, a sweetness, jam, fruits of the forest. It also has violets in-depth, for me a hint of Syrah which adds a spikiness to the blend. In the mouth this is marked as touch of bitterness in the wonderful cherry fruit which rolled over and around the tongue! A lovely wine. Third wine was Los Pinos 0% a brave wine with no preservatives at all……not a non-alcoholic wine! As well as being slphur free the wine was produced by natural yeasts rather than starter variety. Rafa Cambra who is consultant Enologist to the bodega has blended 50%Monastrell, with around 25% each of Garnacha and Syrah. The young wine was purple, coating the glass, and very deep with very long glycerinous legs. On the nose very young but jammy fruit, concentrated, with a touch of vanilla. In the mouth an explosion of fruit and memories of a wine which needs time to settle and evolve in bottle before I evaluate it again. A good start to a fair with its usual very friendly atmosphere and generous welcomes from many bodegas such as Vera de Estenas, Chozas Carrascal, Vinya Natur and others still to visit! And so to rest before taking to the crutches for a final visit and a chat with some very specific bodegas tomorrow!